Then What You’re About To Read Will Answer Those Questions — Once And For All! Dear fellow martial artist, If you’re a committed martial artist who works hard at your discipline… virtually lives it as a way of life… but have a nagging curiosity to find out how it all got started — then keep reading — because this book will put your mind at rest. If you’re like most martial artists I’ve met, then deep down you’ve always been wondering about the ORIGINS of your art, HOW your style started out – and more importantly – what beliefs, ancient stories and mysteries were forgotten when it hit the shores of the Western world. 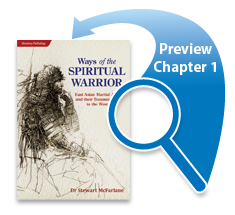 Well, wonder no more, as all your nagging questions are answered in my book: Ways of the SPIRITUAL WARRIOR. As you read this book, not only will it answer all those unspoken questions you’ve had in your mind over the years, but you’ll become better informed and able to connect at a deeper spiritual levelwith the founders, culture and philosophies of your chosen art. My name is Dr. Stewart McFarlane and I’m an expert in T’ai Chi, Far Eastern studies and Buddhism. I’ve researched, taught and lectured on these subjects in Universities around the world all my life. My latest book – “Ways of the SPIRITUAL WARRIOR –East Asian Martial Arts and Their Transition to the West” – is a detailed collection of some of the results of my 35 years training and 30 years researching martial arts. This hard-won research included actually MEETING and TRAINING WITH some of the leading masters of the major forms of East Asian martial arts. The thing is: I wrote this book after noticing that MANY Western martial artists see what they do purely as a sport, a way to stay fit or a self-defence system. Now that’s fine, but if you really want to understand your art at the deepest level, it’s important to have a well-informed grasp of the spiritual, cultural and ideological background to it. And once you become exposed to the thoughts, beliefs and insights inside Ways of the SPIRITUAL WARRIOR, and what’s really going on, your entire mindset changes — dramatically, and immediately. 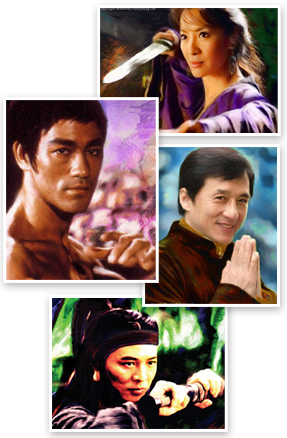 You really will be seen as an all-round expert in your martial art. So as you can see, what you’re getting in this book is the real deal, not some fluff gathered from the Internet by someone POSING as a martial arts expert. When you order, you’ll get a downloadable ebook in PDF format that can be read on any ebook reader. With over 63-pages, complete with high-quality photographs and lavish historical illustrations, the book is incredible value. And in less than two minutes you’ll be immersed in its pages. low price of only $7! That’s right, just $7answers all your questions about the rise of martial arts in the West and the way they’ve merged and adapted over the years into the styles we know today. If “Ways of the SPIRITUAL WARRIOR” doesn’t answer all your questions and nagging curiosity about the origins, beliefs and culture of the martial arts in the East and the impact it’s had on the West, then you’ll receive a full refund, No Questions Asked!! As you can see, all the risk is squarely on my shoulders, so…. Go ahead and click the order link now and you’ll be on your way to enjoying all the benefits we’ve talked about here! You’ll be taken to a totally secure order processing system, where you can order your copy of “Ways of the SPIRITUAL WARRIOR” in complete safety. All it takes is a couple of mouse clicks and a couple of minutes of your time to get your downloadable ebook in PDF format that can be read on any ebook reader. Go ahead and order with confidence! Click Here To Download Your PDF Copy NOW. P.S. This really is the most thoroughly researched and factually reliable knowledge you’ll ever find on the origins of martial arts in the East — and more importantly — it’s dramatic growth and popularity in the West. So be bold and grasp this with both hands! P.P.S. Don’t forget, this is no risk to you as I’m taking all the responsibility on my shoulders. You’re fully covered by my ironclad, 60-day, money-back GUARANTEE.